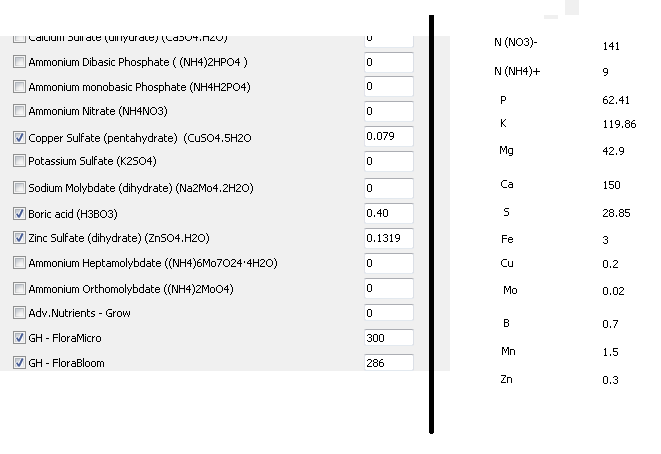 On the last part of this tutorial series I talked about how you could use my hydroponic nutrient calculator to figure out the ppm values of a commercial fertilizer. Today I am going to talk about how you can achieve a given ppm formulation using a commercial preparation figuring out what additional salts you would need to arrive at an adequate composition. I am also going to show how you can figure out the final concentrations of nutrients when using combined commercial fertilizers and salts and how this approach can be used to arrive at full, accurate and complete formulations for your hydroponic reservoir. In the end you will see how my hydroponic calculator (hydroponic buddy) is a great tool for the preparation of your hydroponic nutrients even if you rely solely on commercial formulations. You will need my hydroponic nutrient calculator to follow this tutorial, you can download it here. Today we are going to use a few commercial fertilizers from General Hydroponics and Advanced Nutrients as well as a hydroponic formula to grow tomatoes. The formula - applied for tomato growth in Florida for the first cluster growth stage - can be found here. We are going to use the FloraBloom and FloraMicro nutrients from General Hydroponics (labels here and here) . 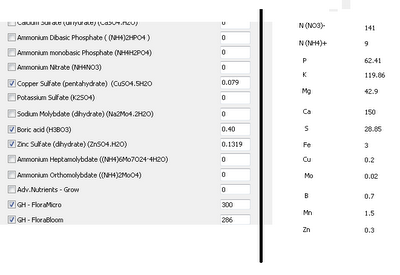 As with yesterday's tutorial the first thing we are going to do is add all the custom fertilizers within the "Nutrients Salts Used" tab by using the "Add New Salt" button by entering the composition percentages found on the label and composition pages of the above mentioned fertilizers. 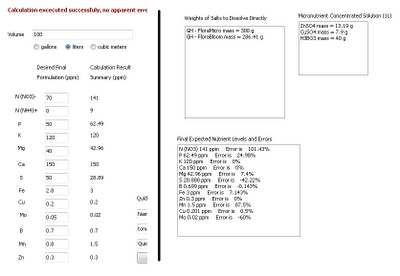 After doing this we input the desired tomato formulation under the "Desired Formulation" tab like it is shown below. Once we have the formulation we select the custom fertilizers, uncheck all other salts and input a volume of 100 liters. After doing this we press the "Calculate Formula !" button which produces hte results shown below. 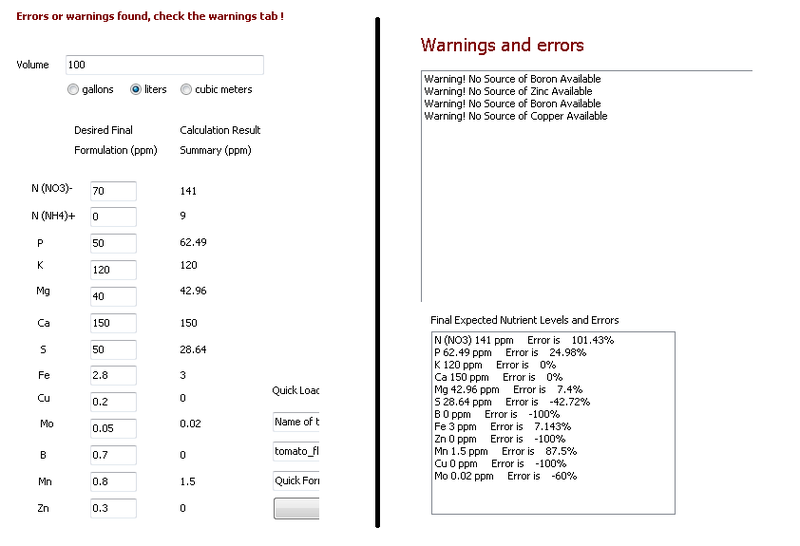 The software also warns us about errors so we need to go to the "Warnings and Errors" tab where we see that certain nutrients are missing from the formulation. In particular we see that we are missing Zn. B and Cu. You will notice that many combinations of hydroponic fertilizers miss one or several essential nutrients for plant growth (even micro-grow-bloom combinations often miss B, Zn and Cu). So right now we need to add sources of these elements to have an adequate formulation. Go to the "Nutrient Salts Used" tab and select Zinc Sulfate, Boric Acid and copper sulfate and press the "Calculate Formula !" button again. 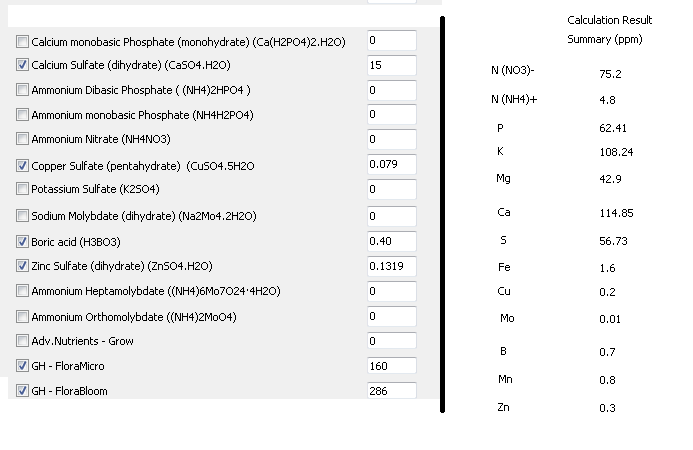 This now produces the results shown below where all elements are present and the program tells us to prepare an additional 1L concentrated solution of Zinc Sulfate, Copper Sulfate and Boric Acid. However we see now that the formula is not very well balanced since we have a 100% excess of N and a defect in S so to achieve the desired composition it might be necessary to tweak the results slightly in a manual fashion and use some additional salts like Calcium Nitrate. 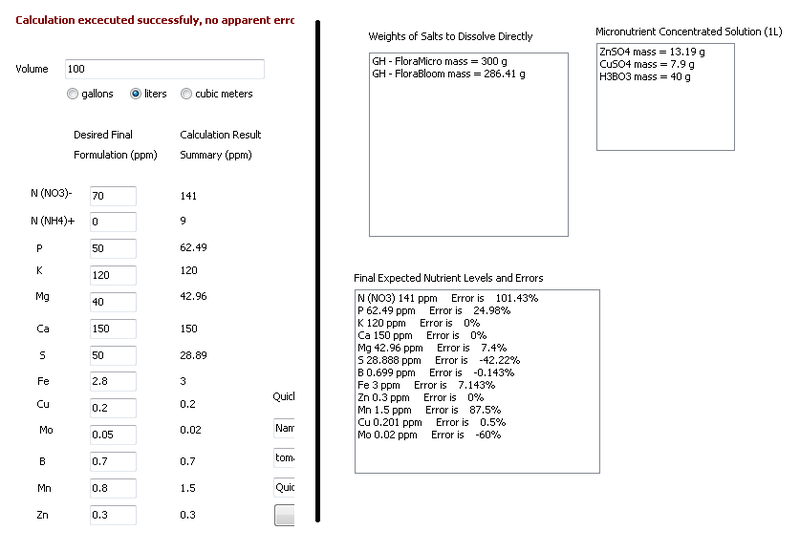 To do this tweaking you should input the weight values obtained on the "Mass" boxes next to each salt's name (the mass of Zn, Cu and B salts is the mass of the concentrated solutions divided by 100 since the 1L concentrated solutions are prepared with a 1:100 dilution factor taken into account). 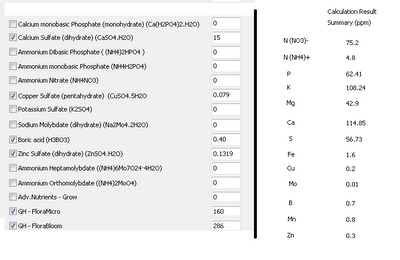 The input and the results of the "salts to formulation" calculation are shown below. Now we need to increase S and decrease N. To decrease N we need to reduce the amount of the most important Nitrogen source (FloraMicro) to about half. Since this reduces the amount of Ca significantly we can now add calcium sulfate to the formulation to make up our now acquired Ca and S deficiencies. Select calcium sulfate and give it a value of 15g. After doing this you will notice that Ca and S concentrations will be much closer to the desired end values given by the original formulations. The final result is shown below. Eventhough the amount of nutrients are not absolutely the same as the ones on the formulation we were able to achieve the same "global ratios" for all important nutrient levels and the solution will now contain ALL the necessary nutrients for adequare plant growth and - in this case - especially for the first cluster development of tomato plants. I hope that this tutorial allows you to understand better how my hydroponic nutrient calculator can be used for the preparation of a wide array of formulas and the correction of commercial nutrient fertilizers that lack some essential nutrients for plant growth. 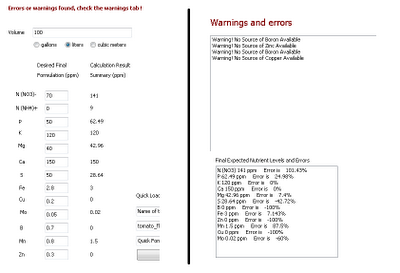 It also shows you how you can modify the results of the automatic calculator to further correct a formula if you believe that better results and pairings can be achieved. As you see, the calculator gives you tremendous flexibility and makes the preparation of hydroponics nutrients with precise ppm nutrient values a simple exercise. Awesome program! Thanks for building it up.